These were considered business vocational courses, and were generally taken by girls who aspired to be secretaries. Nowadays, everyone needs to know their way around a QWERTY keyboard. 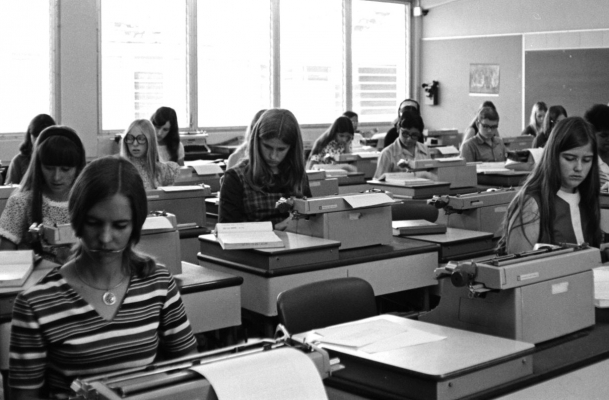 Typing was the most valuable school skill I learned -- ever. Bless whoever it was that encouraged me to take typing as an elective. Served me well in college and happily ever after (like right now). Typing in my school was a required subject and one of my favorite classes as I could type faster than any boy and almost as fast as the best girl, but that was just in words per minute, NOT correct words per minute! In my school, typing was semi-required if you were planning to go to college. For those who didn't take typing, when they went to college they would have to pay people like me to type their term papers. I had to sign up for one of these courses when I started high school (Canada, 1977, Grade 9) and I recall the metronome the teacher setup in the corner of the classroom to help us keep time. One skill I managed to keep after highschool because I can still type with this computer keyboard without looking at my fingers. Oh, by the way, I successfully kicked those Elmer's glue eating and purple ink sniffing habits long before high school.